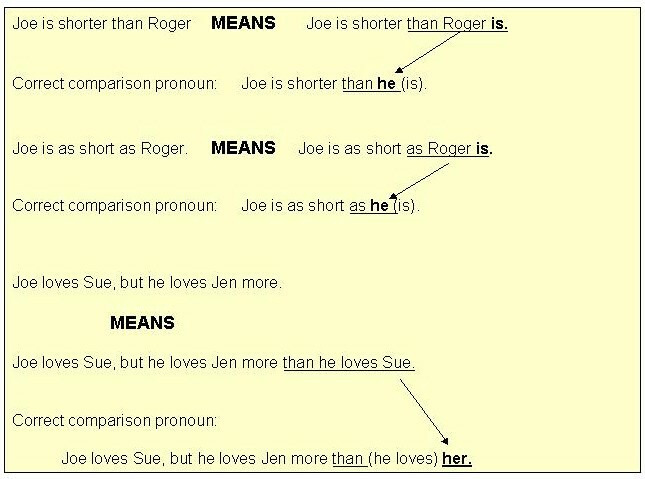 The pronoun's function in a sentence determines which case to use. 1. When a pronoun is used along with a noun, choose the pronoun case that matches the noun's function. 2. When a pronoun is part of a compound element, choose the pronoun case that would be correct if the pronoun were not part of a compound element. half of the compound to check each pronoun. 3. When a personal pronoun is used in a comparison, choose the correct pronoun case by carrying the sentence out to its logical conclusion. 4. 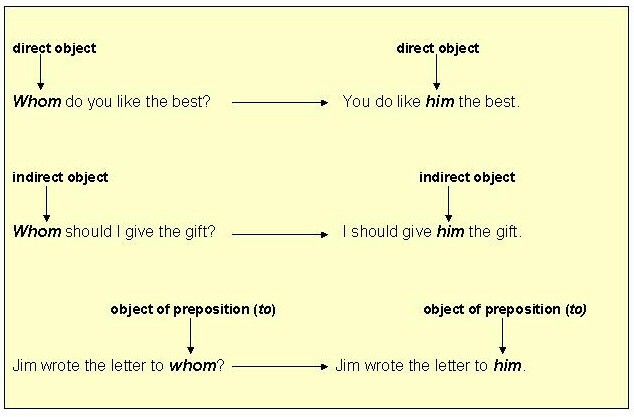 Choose who or whom depending upon the function of the pronoun in the sentence. 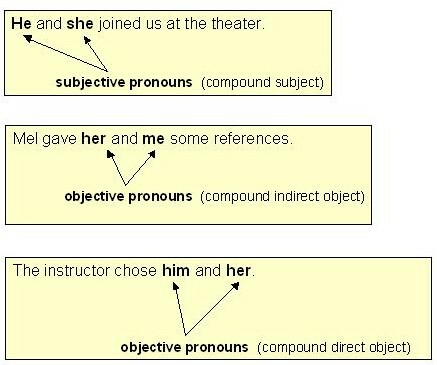 Who is subjective case like the pronouns he, she, they, I, and we. 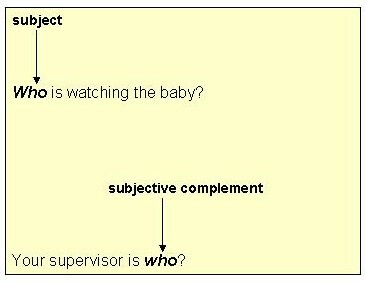 Use who as the subject or subjective complement of a sentence. Helpful tip: To see whether who is the correct choice, substitute he for who. If the sentence sounds correct, then who is the correct choice. Whom is objective case like the pronouns him, her, them, me, and us. 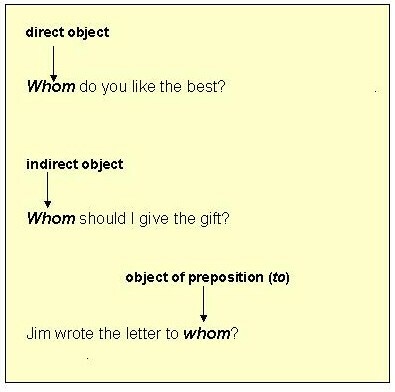 Use whom as the direct object, indirect object, or object of a preposition in a sentence. Helpful tip: To see whether whom is the correct choice, substitute him for whom. If the sentence sounds correct, then whom is the correct choice. 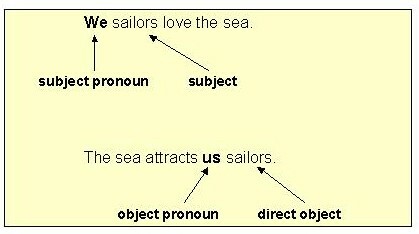 pronoun's function within the subordinate clause. 5. 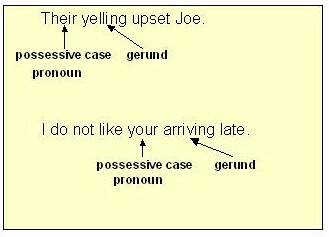 Use possessive case pronouns with gerunds. Reminder: A gerund is a verb form ending in -ing, used as a noun.